Hanoi (VNS/VNA) - The Vietnam Golf Tourism Association (VGTA) was officially founded on March 29 with the aim of boosting the national golf tourism industry. The VGTA gathers State authorities, enterprises, investors and managers of golf courses nationwide. The Vietnam Tourism Association (VITA) has established the VGTA to attract more golf tourists to Vietnam and build a national golf tourism brand, according to Vu The Binh, vice chairman of the VITA. Tourists who come to Vietnam to play golf usually spend more for high-end services and contribute significantly to the tourism industry. “Vietnam has a great potential to develop golf tourism, however we lack experience,” he said. 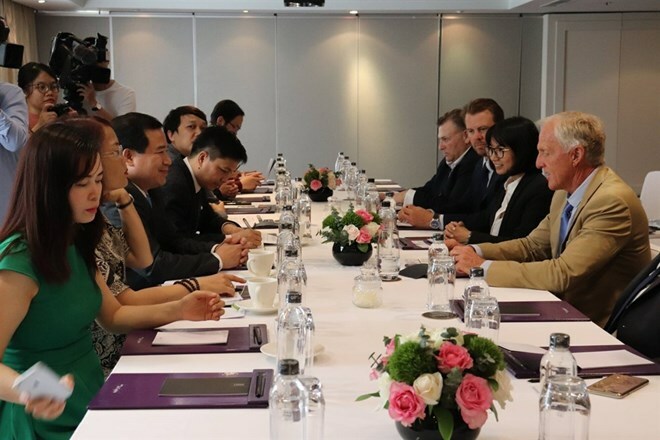 “We expect that with Tourism Ambassador Greg Norman, a world class golfer, tourists who want to play golf will learn more about Vietnam,” he said. Binh also revealed that Japan and the Republic of Korea are the two markets which send the most golfers to Vietnam. Last year, Vietnam received 3.5 million and 800,000 tourists from the RoK and Japan, respectively. Ngo Hoai Chung, vice chairman of the Vietnam Tourism Administration (VNAT), said with the establishment of the VGTA, he expected more tourists and golfers will come to Vietnam and the country will become known as a premier destination for golf.